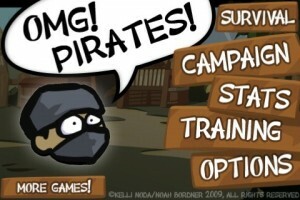 ‘OMG Pirates!’ – A Swashbuckling Ninja Romp! MikaMobile, the makers of the popular Zombieville USA, a game that stood out for its exceptional cell-shaded artwork, have released their second title in the same fashion and OMG Pirates! [App Store] does not disappoint– bettering the Zombieville formula in every conceivable way. OMG Pirates! is a game that takes one thing very seriously– non-stop action. From the get go, you are introduced to a simple plot– your ninja town is in ruins from a pirate invasion, and your silent hero tasks it upon himself to take out every last pirate he can find. The action never lets up, and is only briefly interrupted by the hilarious modes of transportation between one area and the next and the quirky pirate dialogue from the various bosses you encounter, before you proceed to dispatch them in true ninja flair. Each action your ninja takes is an impressively animated feat, be it a combo attack that launches your enemy into the air, or a chain of flip attacks to get out of trouble, you’ll be pulling off some terrific looking moves. Your ninja is controlled with a shuriken-styled analogue stick that offers 360 degrees of movement and there are only three other buttons available to control your ninja; a green jump button; a red attack button; and a gauge/button in the top-left corner that fills as you attack your enemies. This button can be used to unleash a devastating super attack that is both unblockable and affords you invincibility for the length of the attack. This simplistic control scheme belies an extensive repertoire of combos that gradually unlock as you gain experience, a meter that is independent of the game mode you are playing in, but which bestows upon your ninja the skills to progress through the more challenging encounters in OMG Pirates! 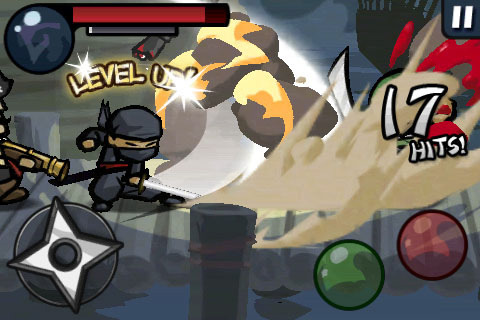 Not only will you need to learn how to counter each enemies’ unique attacks, but to complete the game and excel at the Hard and Survival modes that are subsequently unlocked, you will have to master your ninja’s evasion moves, counters and individual attacks, as well as learning the “tells" unique to each enemy and boss. In this sense, OMG Pirates! has all the hallmarks of a competent console fighter, even ranking your ninja prowess each level on a rather ruthless scale. To round out the package, a catchy pirate-ninja fusion of melodies pervades each level. Sounds are also used as enemy tells throughout the game, so if you are trying to reach those Master ranks, it is advised that you keep the sound on and pay attention. If you prefer to play your own music, that option is also available. OMG Pirates! is an easy recommendation. The campaign comprises 10 levels spanning a few screens each, and an unlockable Hard and Survival mode, as well as a number of ‘secret’ cheat modes that are unlocked on accumulating 5, 10 and 15 master ranks; will ensure that even the most die-hard ninjas will have both their blades and appetites whet by OMG Pirates!.